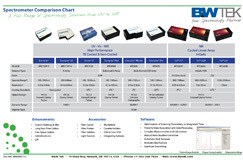 What Does B&W Tek Do? B&W Tek is an advanced instrumentation company producing optical spectroscopy and laser instrumentation, as well as laboratory, portable and handheld Raman systems. We provide spectroscopy and laser solutions for the pharmaceutical, biomedical, physical, chemical, LED lighting and research communities. Originally established as a producer of green lasers in 1997, we’ve grown into an industry-leading, total solutions provider; coupling our core technologies with custom design and manufacturing capabilities. At B&W Tek, not only do we design, manufacture and assemble all of our own products, we also have the knowledge and expertise needed to guarantee that our products will fit the demands of your application. We feel that providing instrumentation is just part of our commitment towards providing your solution. Our research and development team consists of over 30 engineers in varying disciplines, each with an advanced degree in their field, and we’re eager to share our information and experience with you. We even post our knowledge on our website so you can access the answers you need whenever and as often as you’d like. Be sure to download our catalog below and check out our Learning Lab for the most recent material. 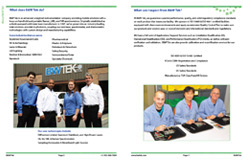 Our OEM catalog provides an overview of our spectrometer modules, accessories and services as well as information about our company history and mission. 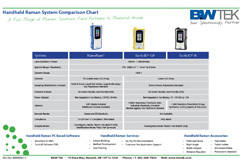 This chart provides an “at a glance” comparison of all of our Handheld Raman systems so that you can more easily choose the right unit for you based on a side by side comparison of specifications. 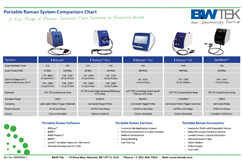 This chart provides an “at a glance” comparison of all of our Portable Raman systems so that you can more easily choose the right unit for you based on a side by side comparison of specifications. This chart provides an “at a glance” comparison of all of our spectrometer modules so that you can more easily choose the right unit for you based on a side by side comparison of specifications.